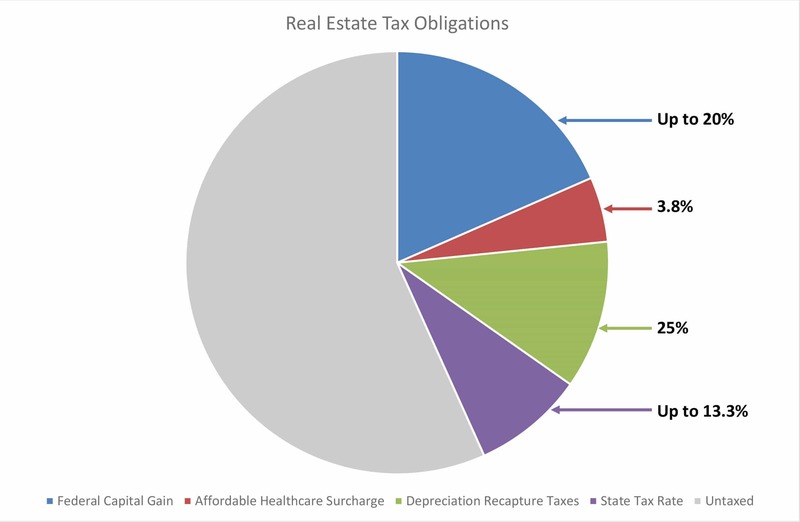 Per Internal Revenue Code Section 1031, an investor can defer capital gains tax and depreciation recapture by reinvesting the proceeds from the sale of investment property into a “like-kind” replacement property. Thus, the full amount of any sales proceeds can be re-invested and thereby providing added potential income while preserving and growing wealth in their estate. 1031 exchange deferrals can be continued through as many exchanges as the investor wishes. Of course, if at any time the investor sells the property without reinvesting in a new property, there will be capital gains and depreciation recapture tax liability. In addition to tax deferral, a 1031 exchange permits investors to purchase a leveraged replacement property and thus increase their basis in the amount of additional debt assumed. This allows for additional depreciation pass-through which can shelter as much as 50% to 60% of the rental income cash flow from income taxation. With the possibility of additional return from appreciation of the property, the after-tax return on investment on an annualized basis can be even greater. A 1031 tax-deferred exchange can be used as a powerful wealth-building tool, but a professional tax advisor should be utilized to ensure that every requirement of Section 1031 is met. Failure to do this can result in immediate tax liabilities and associated penalties. In addition, the strict timeline and procedure requirements for a proper 1031 exchange must be followed to the letter. The following are 1031 exchange accommodators that have assisted our clients on past 1031 transactions. Each accommodator is fully licensed and bonded and can assist in exchanges nationwide.